Has LG solved the home cinema conundrum? A good few years after its last attempt – a wall-mounted projector designed to bust clutter – the latest innovation from the LG labs is this Laser Diode illumination system-powered model. This time it's all about short-throw, with the device able to project a 100-inch Full HD image onto a wall from just 56cm. That tiny distance is a huge achievement – and it produces passive Cinema 3D, too. LG calls it HECTO, and it's massive, about the same size as a high-end projector, or about three Blu-ray players piled on top of each other. Around the back of it are three HDMI inputs and a set of component video inputs, while the laser-driven light itself projects images onto a supplied screen. HECTO, which has typical gloss-black styling, also has its own stereo speakers. They're rated at 10W each, so about the same power as a regular flat TV. It does seem a missed opportunity to develop a totally built-in home cinema. A powerful Yamaha-style soundbar combined with HECTO would have blown socks off, but it gets even more complicated since under HECTO's screen at CES was a long and slender soundbar that appears to have been custom-built for the job. There's a subwoofer nearby, too, and together they create possibly the most impactful part of the HECTO demo. Naturally, they cost extra, though we weren't able to find out how much. Furthermore, HECTO is a two-piece affair, which jacks up the cost. 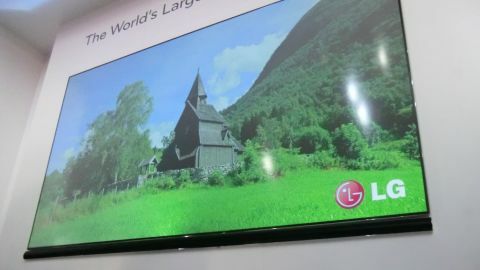 LG's booth attendants assured us that the 100-inch passive screen, which has a border akin to a slim-bezel LED TV, has a specially reflective layer that's about the same thickness as four or five credit cards. It comes as a two-part kit, something that will probably stop high-end home cinema owners from upgrading to HECTO. With the screen needing to be specially positioned, it's probably destined for a custom installation future – or possibly in a boardroom – since it all seems rather fiddly. HECTO plays nicely with a Magic Remote's pointer-style cursor for navigation and has the full Smart TV interface on board – including voice navigation – and that's probably as good a reason to invest as any other. It's hard to judge a projector like this in a convention center, but images from HECTO were a mixed bag on the CES show floor. There were no direct lights near the screen, though it's not the blackout that we missed most, but detail. The laser diode unit delivers surprisingly bright images with middling contrast (though it's quoted at 10,000,000 :1), but as well as some washed-out and imprecise colours, the image is far from the most detailed we've seen this week. There's a reason why 85-inch+ TVs are now using Ultra HD. "It has Full HD quality with all the features of a smart TV," said Dr Skott Ahn, Global President and Chief Technology Officer at HECTO's launch. "And you don't get messy cables everywhere. This is not a prototype and not a demo – we've made it a reality. It will be available in Korea in January and in the USA in March." In theory the HECTO makes it possible to have a home cinema without needing to position components at the rear of the room where the projector must be, though that slight convenience comes at a whopping price. It's due to go on sale in March for US$10,000, which is more than the company's OLED TV. Granted, that's only 55-inches in diameter, but we're pretty sure that most TV companies will have 'budget' giant screen TVs by this time next year for less than $10,000.